They say there’s nothing new under the sun, or on the internet, but I’ve never seen a website quite like this before. 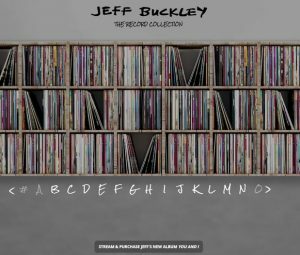 Jeff Buckley: The Record Collection is a new interactive site that not only provides deep insight into one of the most transcendent artists in Rock history, it also promises the user the opportunity to stream and discover some of the best music ever made. 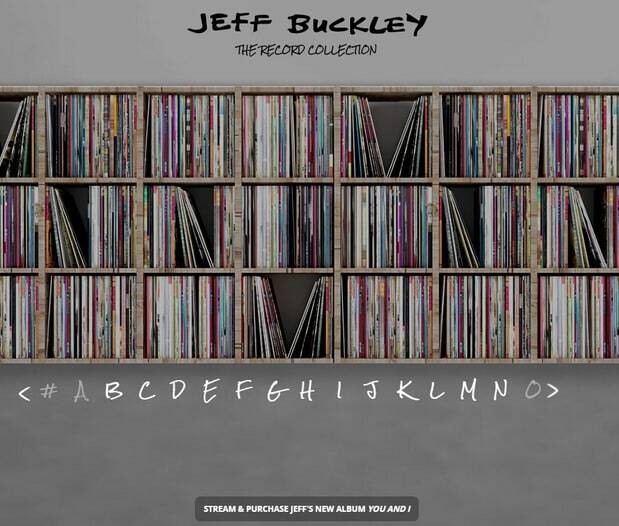 Sony Legacy Recordings has partnered with Buckley’s mother Mary Guibert to deliver a deceptively simple site that offers some fantastic listening. It is basically one page that shows the spines of the LPs in Buckley’s collection. Dragging your mouse over the spines reveals each album’s artist and title. Clicking on each album opens up a player that samples 30 seconds of each song on that album, while Spotify subscribers can listen to each song in its entirety. Jeff Buckley was a shooting star who released only one official studio album before his accidental death by drowning at age 31 in 1997. But by that time he had already established his own completely original style as a vocalist, guitar player and songwriter, and his influence clearly lives on 20 years later. Earlier this year his estate released an album of solo studio outtakes and cover songs which we highly recommended. It’s fascinating to see how his choices for cover songs on that album are rooted in his own record collection. He’s got Dylan’s Blonde On Blonde from which he covered “Just Like a Woman”, Zep’s Physical Graffiti from which he played “Night Flight”, and The Smiths’ The Queen Is Dead from which he borrowed “The Boy With The Thorn In His Side”. His album collection is wildly eclectic as every great Rocker’s should be, since Rock is the mongrel genre that draws influences from everywhere and everything. There’s Rock, Pop, Jazz, Classical, Country and everything in between. He’s got 9 Beatles albums, 14 Bowie albums, 4 Ray Charles albums, 11 Cocteau Twins albums, 11 Leonard Cohen albums, 17 Miles Davis albums, 10 Genesis albums, 7 Iggy Pop/Stooges albums, 10 Joni Mitchell albums, 8 Queen albums, 4 from Social Distortion, 7 from Sly and the Family Stone, and all kinds of other artists from Metallica to Muddy Waters to Carole King to Peter Tosh. As far as I’m concerned it’s a blueprint for musical creativity. 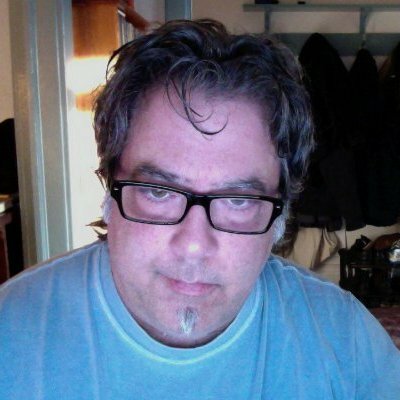 I plan on spending some time exploring there, and I think every serious fan of Rock should try to do the same.